President Bashar al-Assad said that you cannot take any concrete political step before defeating terrorism, because this is the biggest obstacle, and this is the prime concern to every Syrian. Question 1: Good morning, President Assad. Thank you for having us in this presidential palace. You see, when people talk about the crisis in Syria, the term “civil war” is often heard, but it seems like you never agree with it. You don’t think it’s a civil war going on in Syria, do you? President Assad: First of all, you are most welcome in Syria. I’m glad to do the first interview with the Phoenix channel. Regarding the definition of this crisis, no, it’s not a civil war. You can say this is civil war when you have a certain line that divide between different components of a certain society, whether sectarian or ethnic or maybe political line, something that we don’t have in Syria. Civil war has internal factors, not states supporting terrorists who come to Syria while they announce publically that their aim is to change the state or, like what they call it, the regime. So no, it’s not civil war; it’s war. Question 3: You see, there are both Russian and NATO military activity going on in and over Syria. So, in your opinion, what are the differences in their presences in Syria, and are they both having effective coordination with the Syrian government? President Assad: Let’s make this comparison through the facts; before the Russian participation started about two months ago, it had been more than a year the American – what they call “American alliance” – started their campaign against the terrorists, but the result is that the terrorists have gained more ground and more recruits from around the world. During the first month of the Russian participation, the same terrorists groups have been retreating and fleeing Syria in thousands to Turkey then to other countries; some to Europe, some to Yemen, and other areas. So, this is the fact. The second one, the mythology; you cannot fight terrorism through air raids. You need troops on the ground. The Americans only fight through their airplanes. Question 4: And how about the Russians? Are they sending any troops? They are not, right? President Assad: What about the Russians? They are depending on the Syrian troops on the ground. They are cooperating with us. So, the difference, the main difference, is that the Americans don’t cooperate with any ground troops, while the Russians are doing this. President Assad: At all, not a single communication or connection. Question 6: Speaking of coordination, we see that the Russian and American planes, they carried out flight tests last week, according to Washington it’s a planned communication test, and according to Moscow it’s joint military exercise, so what is it? So, which terms is more accurate, and what is the purpose of this test or exercise, whatever you name it? President Assad: It was publically announced: not to have any conflict between the Russian and the American airplanes or aircrafts, because they work sometimes in the same area. This is the only reason. Question 7: And that’s it? Just to validate the safety protocols? They are not ready to fight together against the terrorism yet? President Assad: They [the Americans] didn’t actually; they took some actions against some terrorists in some areas in order to prevent them from attacking certain areas that they don’t want them to be in, but they didn’t do the same, for example, when the terrorists attacked Palmyra, which is a very important city, regarding its heritage, around the world. They didn’t do anything. Question 8: Mr. President, how can you be sure that there’s no moderate oppositions in Syria? And if that really is the case, how do you understand the fact that last week, in one day, the Russian planes bombed dozens of targets using the coordinates supplied by the opposition groups. Have you been informed of this? President Assad: Actually, there’s no tangible “opposition group,” under two quotations. First of all, if you want to define “opposition group,” we don’t mean militants, because when you talk about opposition, it’s a political term, not a military term. Whenever you hold a machinegun, you are a militant, you are a terrorist, whatever you want, but you cannot call “opposition” people who hold machineguns or any kind of armaments. But if you want to talk about who is related to extremists – this is the debate now – actually, no, the majority of those groups are linked to Al Qaeda, whether ISIS or al-Nusra, and we didn’t define them; they defined themselves through videos. You can find them on YouTube, on the internet, they published pictures from the very first day they started slaughtering, eating hearts, beheading, and dismemberment, and so on. So, they defined themselves as extremist groups. While if you want to talk about the opposition in the moderate way, you can talk about the political opposition that you have some of them within Syria, some of them outside Syria. Part of this opposition supported the terrorists politically, and some of them no; they stood against the terrorists and supported their government, although they are opposition. President Assad: Yes, again, it’s not opposition groups; they work with some of the militants, and we deal with some of the militants, because we need reconciliations in Syria. If you want to make reconciliations, local reconciliations, you want to talk to the people who have the armaments. So, we dealt with them, and there’s cooperation between the Syrians and the Russians regarding this kind of reconciliation. So, yes, they did recently, and we encourage them to do so, because this is the most effective way to make the situation better and to reach peace in the future. Question 10: How do you understand the existence of the IS? Some say that they originated from Iraq, some say they originated from Syria. Where did their ideology come from anyway, and who is backing them financially? President Assad: In 2006, it was announced in Iraq as IS, which is the Islamic State, but it was “of Iraq” at that time, and their leader was al-Zarkawi who was killed by the Americans. The Americans announced his assassination. So, they announced that there is the Islamic State in Iraq under their supervision, or let’s say under American occupation. So, the Americans said that, so no-one can say that it didn’t exist in Iraq or it didn’t exist under the American supervision. This is clear. ISIS and al-Nusra, they are offshoots of Al Qaeda in Afghanistan, and in Afghanistan – as Clinton said, and as everybody knows – they were formed in Afghanistan to fight the Soviets at that time with Saudi money and American supervision and instructions. So, this is very clear, this is reality. Now, their ideology is the Wahabi ideology, the Wahabi-Saudi ideology. Who supported them? The Saudi family supported the Wahabi institution publically and formally, and of course we have so many figures, Wahabi figures, who can send money to them. Logistically, all kinds of supports to ISIS, whether it’s human resources, money, and selling their oil, and so on, passes through Turkey, in cooperation with the Saudis and Qataris, and of course with American and Western overlooking of what’s going on. But without this logistical space, or let’s say backyard, to ISIS, ISIS cannot survive, because it doesn’t incubation in Syria, it doesn’t have the incubator in Syria. President Assad: No, they don’t. So far, they don’t. They are like a foreign body in our country. But because of the fear, because of the oppression, because of the killing, they could take some areas. But actually, their force is coming from Turkey with the personal support of Erdogan and Davutoglu. Question 13: But you see, I don’t understand what happened. It seemed like Syria and Saudi Arabia, Syria and Turkey, used to have good relationships before the crisis, so happened? It seems like all of a sudden, they just turned against Syria, or turned against you. How do you understand it? President Assad: For us, I mean as a politician, as a state, as a government, their main goal is to work for the sake of their people, so whatever is proposed to be good, we have to follow it. So, if those countries are ready to stop supporting terrorists, we don’t have any problem. It’s not about living in the pat; we look to the future. So, we have to work in order to reach that point. After that, the people, their interests, their feelings, will define what kind of relations we can have with those countries. But we cannot say that we’re not going to have this relation. At the end we have people; it’s not only about the government. In Turkey you have 70 millions or more than 70 millions, and many of them are against Erdogan, many of them they understand what is happening in Syria, and they understand that if there’s fire in Syria, the fire will burn Turkey later. President Assad: Emotions are very, how to say, I mean if you want to talk about the feelings of the people, you can talk about a kind of… like they are inflamed. But at the end, the people will define and they will for their interest, and they’re going to be aware. Of course, you cannot say that every Syrian is against or every Syrian is with; people are different. But at the end, I think, they will forget about what happened when they can see the bright future. President Assad: If you talk about after the crisis, we have to define what political system you want, that is the most important thing. You can discuss it now, but it’s not related to the terrorism issue. The terrorism issue is related to maybe completely different factors; internal and external. If you want to talk about the future of Syria, it’s mainly the political system; parliamentarian, presidential, semi-presidential, federal, confederal, and so on. But the most important thing, for us and for me, is that the constitution and the whole system and the country in general should be secular. Secular doesn’t mean against religion. Secular means the freedom of religions. It’s the system that can include every religion’s followers, every sect, and every ethnicity under one umbrella, which is the Syrian umbrella. This is first. Second, I think the main concern is going to be the economy, the reconstruction, and this is going to be an important sector in rebuilding Syria. Question 18: We’re going to come back to the economic aspect later, but if there’s going to be elections soon, do you see yourself participating as a candidate? Question 19: How was your recent trip to Moscow? And I assume that you and President Putin talked about the crisis in Syria. I mean, is there any specific plan that you’re working on, or how long you and President Putin think that it will take before the war ends? 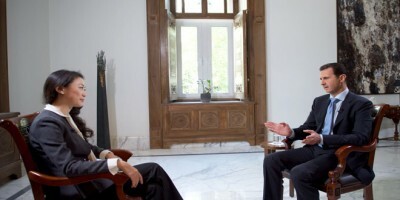 President Assad: You mean regarding the political aspect of the crisis? You know now Russia is leading the political activity regarding Syria in the world, and my visit was about two weeks or three weeks before the Vienna conference. That’s why I had that visit; in order to see what the horizon is in the political field regarding this crisis, what could be done. Now, Vienna defined some of the headlines which is general terms of course. At the end, Vienna mentioned elections and new constitution and so on, but at the end it’s about what the Syrians would agree upon, so there must be dialogue. That’s why I said in Moscow “we are ready for Moscow 3” because we need to have dialogue, whatever Vienna said or any other conference. At the end, what the Syrians will say; with or against. So, that’s what we’re working on with the Russians; is to hold new dialogue meeting between the Syrians, maybe in Moscow, and if so, it’s going to be called Moscow 3. President Assad: Yes, we had, and we announced it before that visit. The Russians said and we said that you cannot take any concrete political step before defeating terrorism, because this is the biggest obstacle, and this is the prime concern to every Syrian; every Syrian wants to have security and safety. How can you achieve anything in your life if you’re not secure, politically or economically or in any other aspect? So, this is the priority. So, what we are doing in parallel beside fighting terrorism, we need to make the dialogue, but the concrete steps should follow at least a major defeat of the terrorists and the government takes control of a major area that has been captured by the terrorists. This is where you can take those steps, and the major step regarding the political, let’s say, part of the crisis, is to discuss the constitution, because the constitution will define the system, and both will define the future of Syria. So, this is our aim. Later, if there’s a dialogue, if the Syrians want any other procedure, like what you mentioned something related to the presidential elections, this is going to be part of the dialogue between the Syrians. I cannot say this is my plan or not my plan, because not everything is related to the president. We propose the major issue, then the rest will be the result of the dialogue between the Syrians. President Assad: No, for one reason; because what is the timeline of defeating the terrorists? It’s a war, no-one can define when because it’s related not to only our advancement or to what they are going to do; it’s related to the support that they are going to have from other countries, because many countries, in the West, in our region, they don’t have any interest in any political solution. They only believe in supporting terrorists in order to topple the government and to have political collapse in Syria. So, they want it to drag on. But if you ask me, I mean if you don’t have that support, in less than one year you can change the situation and you can defeat the terrorists and you can start this process. But if you want to talk about the process after defeating the terrorists, if you want to talk about after that, you can talk about a maximum of two years of implementing everything, because when you talk about dialogue, then you’re going to talk about the constitution, you need to make referendum. Who’s going to define? People will accept or don’t accept? We don’t know. Then, you may have another possibility. So, more than two years, you don’t need. So, two years is enough. Let’s say this is range that we’re thinking about. Question 24: You have visited China in 2004. At the end throughout all these years, especially the past five years, are you still a sort of communication channel with the Chinese government? And is there any message that you would like to deliver to China, to the Chinese people, at this stage? President Assad: We recently had Syrian officials visiting China. Actually, the relation with China hasn’t deteriorated, and the communications didn’t stop. We still have embassy, and your ambassador is still active during the crisis, he never left. And the most important thing than these formal, let’s say, accessories, if you want to call it, actually the Chinese positions. China took four vetoes for the Syrian crisis, supporting the government, supporting the Syrian people, and supporting the international law, and let’s say the United Nations Charter. So, yes, the relation is very stable, let’s say, for decades now. Indeed, it wasn’t influenced by the crisis. But the most important thing to the Chinese people, now China is one of the greatest countries in this world, to be a great country doesn’t mean to have a great military and great economy; you need to have great values, and that’s what the Chinese have today. And when you talk about the Chinese government, Chinese politics, it normally reflects the values of the people, it’s not separated. So, the more role you have in the world, the more influence, the more weight, the greater you are as a country, the more responsibility you have towards the rest of the world, all the world. You have to regain the balance of the globe, and you have to support the values and the United Nations Charter. You have to rectify the moral decay of the Western policies that we’ve been paying the price of. So, we look toward what the Chinese people and the Chinese government will do for our world in the future, near future and after. President Assad: As much as it is Syrian heritage, actually it’s a global heritage, and you understand what I’m talking about because you belong to a country that has one of the oldest civilizations in the world, and your neighboring countries like Afghanistan and so on suffer from the same cultural disaster. The same happened in Iraq after the American invasion. Now, that’s what’s happening in Syria. Some of those international heritage sites have been demolished; they cannot be restored. There’s another part of the problem; that many of the monuments could be smuggled outside Syria in order to be sold internationally. But fortunately, I think all of them are documented, and they are registered in the UNESCO, so we are going to work with friendly countries and international organizations including the UNESCO in order to get back our heritage. President Assad: Actually, I saw that photo, but we saw so many other photos, so you cannot feel the whole crisis through one picture, because we live in this crisis, we live with the bloodletting by the terrorists on daily basis. So we feel the sadness on daily basis. But that photo was used as propaganda by the West, and unfortunately in a very horrible way, because there are two reasons why those refugees left Syria: part of them left because of the dire threats by the terrorists themselves, they left their areas – of course, some of them left to government areas, and some of them left outside Syria, and the other part left because of the Western embargo, not because only of the terrorism and its influence, because of the Western embargo that influenced everything; the education, the health sector more than any other thing, and the basics of the daily living. So the problem of the West when they use that photo as propaganda to show their compassion with the Syrian people, is that this West, as a double standard as always, they offer the Syrian people with one hand, let’s say, a dish of food, and with the other hand a bomb. That’s the reality, because they supported the terrorists, those people and this boy and other boys and other children suffered and died and are being killed because of the Western policies in this world, in this region, and mainly inside Syria. President Assad: Personally, I can only feel strong as a president or as an official when the Syrian people are strong. It’s not a matter of personal ability; it’s more as national ability. When you talk about national ability, you should relate it to the Syrian people. We suffered a lot, we lost a lot, as Syrians, but at the same time, if you go around Syria, you see this determination. You are fighting terrorists coming from more than 100 countries around the world, including China of course, and most of Europe, and Russia, and other countries, and they are supported by the strongest countries in the world, including the United States, and by the richest countries including Saudi Arabia and Qatar. In spite of that, they haven’t been defeated. So, I can say yes, the Syrian people are strong, and they are becoming stronger against the terrorism, yes. President Assad: Because I believe in the Syrian people first, I believe that I’m working for my country and for the Syrian people, not for myself. The West wanted to portray the situation as a problem regarding a president who wants to stay in power, he wants to stay on his chair, and he wants to kill the people because they want to get rid of him. That’s not the reality. How can you stay when you have the opposition of not only the terrorists inside Syria, but also the strongest countries and the richest countries, and you stay for five years? It means you have the support of, at least, let’s say, more than half of the Syrians. I wouldn’t talk about the majority, but more than half of the Syrian people. Without that, how can you stay here? It’s not a matter of a superman, it’s the matter of a normal person, he has the support of the public opinion. The problem with the West is they didn’t understand the Syrian people, they don’t understand this region. That’s why they miscalculated at the very beginning, they thought it was a matter of a few weeks or a few months, like what happened in Tunisia and in Egypt, and now because they failed, they want to blame somebody else, they look for a scapegoat, and they want to say it’s me, it’s some other reasons, and so on. But actually, they miscalculated, and I believed in the Syrian population. President Assad: Actually, you can talk about strategies, and you can talk about tactics. Regarding strategy, it was based on two things: first of all, from the very first day, we were determined to fight terrorism. We never had any other position, we want to fight terrorism and defend our people. The second one, is to make dialogue, and from the very first day we opened the doors for any dialogue. Some opposition accepted that, and some others didn’t. So, our methodology and our strategy, I wouldn’t say they were wrong. I think we need to continue in opening the door for dialogue and fighting terrorism. So, we’re never going to change that. Most of the things that you mentioned could be related to the tactics. Of course you change it, because every day you make mistakes, and what’s correct today is going to be wrong tomorrow. For example, if you want to draw one example, we trust many in Syria that they are working for their country, then we discover that they are working for the terrorists, and some working for other states to implement the agenda of foreign countries, and so on. So, in the tactics you always commit mistakes. Question 33: Thank you very much, President Assad. Thank you for your time.